Animated movies are still very much big business, regardless of how much of the market Disney and Pixar may be covering – and it is therefore heartening to see studios such as Illumination continuing to make great-looking, appealing and funny family pictures that have captured our attention in ways that Disney have done so well in years gone by. The hugely successful Despicable Me and the runaway success of the Minions characters only helps to prove that it doesn’t necessarily have to come from the house of mouse for a cartoon to be considered worthy of viewing. Certainly, while there’s a lot of imagination in The Secret Life of Pets, it sadly never reaches the level of sheer entertainment that Despicable Me 2 managed years prior. The Secret Life of Pets surrounds just that – what happens to your pets when you go out to work for the day? 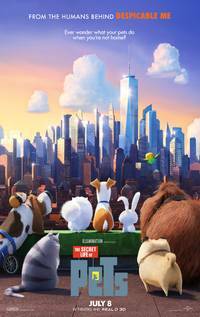 As the movie follows the lives of several city pets – Max, the loyal canine who’s forced to live with rambunctious and larger-than-life Duke as his owner’s new adoptee, finds himself struggling to adapt to his new live-in ‘brother’ – while his various friends of all shapes and sizes, from fellow dogs to birds and guinea pigs all offer their unique takes on what life in the city without human interaction means to them. When Max and Duke find themselves lost in the city and towed away to the local pound, little do they know that they’re about to see a whole other side to the animal community, and it is up to their friends to find them and bring them home. On a positive note, Pets is, on a base level, very entertaining – at least in terms of its comic timing and its characters. This is a well-realised voice cast and a set of character designs that are memorable, likeable and are typical of Illumination’s standards – Despicable Me, after all, made a villain into a likeable protagonist and doting foster-father – and it’s hard not to like many of the city’s pets charming, adorable and above all, funny. 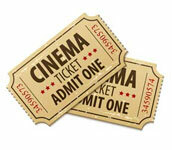 This is a movie that knows how slapstick works – like Minions before them, this is comic timing at its absolute best, offering universal moments of hilarity to both adults and children alike. That being said, if the characters and the laughs are so good, what is it that makes Pets only a three-star movie? Sadly, a lot of problems befall this movie when it’s not being straightforward. The opening twenty minutes, solely focusing on what pets do when left alone – are fantastic. They’re well-realised, funny and adorable. However, beyond this, once the movie ‘hits the road’ and Max and Duke find themselves tangled up in a world of human-hating animals, it becomes fairly bizarre, weirdly inconsequential, and – in some places – rather dark. There is some incredibly scary imagery in this movie that betray the ‘Universal’ rating that it received, and for younger children, there is high peril galore – perhaps more so than in any of Illumination’s earlier releases – and it is therefore a stark contrast in comparison with the cute slice-of-life moments we saw at the start of the movie. This is a movie that starts out as an observation, but quickly becomes a muddled and sadly predictable chase movie – and maybe not even that. There are moments of despair and peril dotted throughout the film, and while it thankfully fails to diminish the great cast and comic timing that elevate the script, there is still the nagging sense that this is a story that could have been so much more. Clearly aiming to be a take on the Toy Story formula, where Pixar’s 1995 hit succeeded in offering a completely new but straightforward tale, Pets attempts to offer a fairly uninspiring story that, thankfully, benefits from a few laughs along the way. While not truly mediocre, this is a movie that falls short of the mark on the basis of one or two elements weighing down those which could have made it wonderful, and much more memorable to boot. The Secret Life of Pets is a great family film – the humour is palatable on a number of levels and, visually, it’s superb. This is a colourful, sprightly, fun movie that will generate laughs, that much I can guarantee – but on the basis of both a lacklustre story and a number of excessively violent or mean-spirited turns in the tale, it will sadly never be considered in the same league as other family movies to be released this year. While Zootopia may have risked offering adult concepts to a young audience, it succeeded in creating a rich world of characters that inspired and entertained viewers in equal measure. While Pets gets laughs, and looks and sounds fantastic, it simply doesn’t seem to have the same heart, or the same vision. For a movie that is so visually appealing, and is so gifted at getting the jokes on the money each and every time, it is disappointing that it offers an unoriginal script with slides into inappropriate tone choices for the bulk of the run-time. It’s unlikely that kids will complain – and there have been far worse animated movies released this year – but I would recommend leaving younger kids at home for this one for a number of reasons.